Origin and Production2). 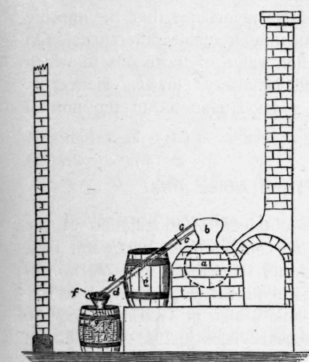 The oldest method employed in the United States for the utilization of pine wood viz., destructive distillation, is still employed to a considerable extent to-day. The cylindrical retorts employed are mounted horizontally. Their capacity varies from 3/4 to 5 cords and averages 1 to 2 cords3). A charge requires as a rule 24 to 48 hrs. ; the largest charges demand as much time as five days. The pine tar oil that distils over first is rectified over alkali from a copper still. At first there distills over an unpleasant smelling liquid with a sp. gr. 0,840. This is followed by a fraction, sp. gr. 0,865 possessing the same properties as those of wood turpentine oil. Finally there distils over an oil which probably consists of dipentene and some sylvestrene. The specific gravity of the very last portions rises as high as 0,930. Apparently they contain terpineol. This is noteworthy since similar dense substances have not been observed in European pine tar oils from Pinus silvestris. 1) Zeitschr. f. angew. Chem. 20 (1907), 1811. 2) J. E. Teeple, Pine products from pine woods. Seventh International Congress of Applied Chemistry. Section IV. A. 1, p. 60. - Journ. Soc. chem. Industry 26 (1907), 811. 3) 1 Cord = 8X4X4 feet. American pine tar oil is mostly used in the crude state as disinfectant or as a wood turpentine oil of inferior quality. Properties. Two samples of American pine tar oil, presumably from Georgia, have been examined by E. Kremers1). They possessed a slightly empyreumatic odor. When shaken with 5 p.c. caustic soda solution their color darkened, d 0,856 and 0,860; aD + 13°40' and + 13°42'. Upon fractionation the bulk distilled over at the boiling point of pinene. The odor and rotation of the higher boiling fractions indicate dipentene. For purified American pine tar oil, the Department of Agriculture records the following constants2): d20o,857 to 0,898; aD20o +34,4 to +77,6°; nD2001,4666 to 1,4810; it begins to boil at 150 to 166° (uncorr. ), up to 170° 0 to 93 p.c. distill over, up to 185° 61 to 97 p.c; iodine value according to Wijs 300 to 398; A. V. 0,028 to 0,246; S. V. 0,65 to 4,32; colorimeter value (Lovibond) for yellow 0,4 to 4,5, for red 0,0 to 0,8. The fragrant oils distilled from the young leaves and twigs, also the one-year-old cones of pines, firs and larches are commonly designated, though not quite correctly, as pine needle oils (Ger. Fichtennadelole). Commonly the names assigned to the commercial distillates of this group in the price lists of manufacturers and dealers are no more correct. Hence it is not always possible to infer the correct botanical source from the commercial name. Inasmuch as well established names, though wrong, are difficult to eradicate, it is likely that they will be continued for some time. It may scarcely be necessary to point out that in the following accounts the correct names only are applied. 1) Pharm. Review 22 (1904), 150. This condition is partly due to the confusion that exists both in the scientific as well as the common nomenclature of the conifers. For this reason the statements found in older literature must be accepted cautiously. Fig. 11. Old Thuringian still for nine needle oils. Fig. 12. 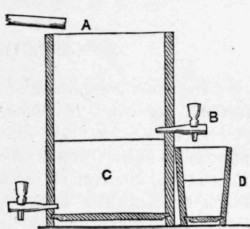 Receptacle for the collection of the distillate and the separation of the oil from the water. On account of their balsamic and refreshing pine-woods odor, these oils have been used extensively in the preparation of various pine essences for spraying of dwelling and sick rooms, in the preparation of aromatic baths, in perfumery and in the finer soap industry. Hence in recent years they have become common articles of commerce. The pine needle oils, more particularly the cheaper ones, are frequently adulterated with turpentine oil. Inasmuch as pinene is likewise a normal constituent of these oils, its presence is not indicative of adulteration. The presence of an appreciable addition of turpentine oil can be ascertained by means of fractional distillation. The amounts distilling over between certain temperature limits are compared with those of a genuine oil. In case of oils adulterated with turpentine oil, the amounts distilling over at 160° or below 170° are much larger than with pure oils. As clues for such examinations, the results of quantitative fractionations are recorded in connection with the principal oils to be discussed hereafter. In the examination of these oils, the optical rotation is of much greater importance than the specific gravity, for the latter shows but unappreciable differences. On the other hand, the saponification value of those oils to which turpentine oil has been added is always lower. Hence, in general this constant affords a good clue as to the normal character of the pine needle oils.